Remove the tire valve cap. 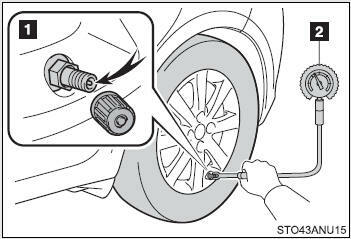 Press the tip of the tire pressure gauge onto the tire valve. Read the pressure using the gauge gradations. If the tire inflation pressure is not at the recommended level, adjust the pressure. If you add too much air, press the center of the valve to deflate. After completing the tire inflation pressure measurement and adjustment, apply soapy water to the valve and check for leakage. Put the tire valve cap back on. You should check tire inflation pressure every two weeks, or at least once a month. 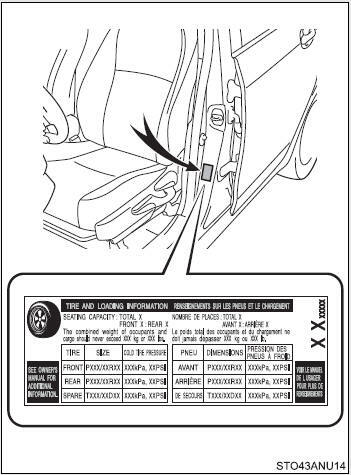 Do not forget to check the spare. If a tire needs frequent inflating, have it checked by your Toyota dealer. ●Check only when the tires are cold. If your vehicle has been parked for at least 3 hours or has not been driven for more than 1 mile or 1.5 km, you will get an accurate cold tire inflation pressure reading. ●Always use a tire pressure gauge. The appearance of the tire can be misleading. In addition, tire inflation pressures that is even just a few pounds off can affect ride quality and handling. ●Do not reduce tire inflation pressure after driving. It is normal for tire inflation pressure to be higher after driving. ●Never exceed the vehicle capacity weight. Passengers and luggage weight should be placed so that the vehicle is balanced. Be sure to put the tire valve caps back on. Without the valve caps, dirt or moisture could get into the valve and cause air leakage, which could result in an accident. If the caps are lost, replace them as soon as possible.